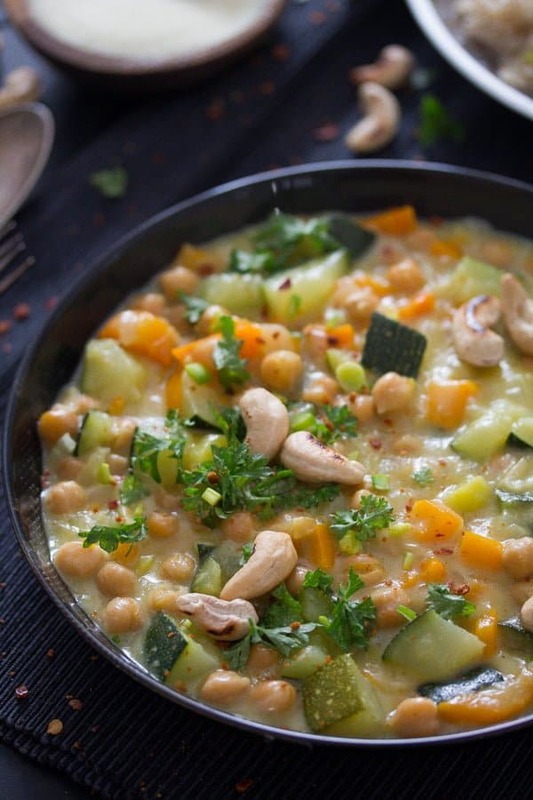 An easy chickpea curry with coconut milk and zucchini, topped with crunchy, roasted cashews. 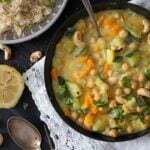 Another zucchini recipe, a vegan chickpea or zucchini curry recipe with coconut milk. A good curry is one of my favorite ways of enjoying vegetables and vegan dishes. I am not even remotely a vegan, not even vegetarian, but still I try to keep our intake of meat to an acceptable minimum, so most of my cooking evolves around vegetables and at least once a week I try to serve my family a main dish that is vegan. And nothing is easier to keep vegan than a curry I think (or a soup). I take whatever veggies happen to be in season and in my fridge, throw in some curry paste or curry powder, something to give the dish some body like chickpeas or beans or sometimes potatoes/ sweet potatoes or tofu. One can of coconut milk, which I always have in my pantry, and I’m done. 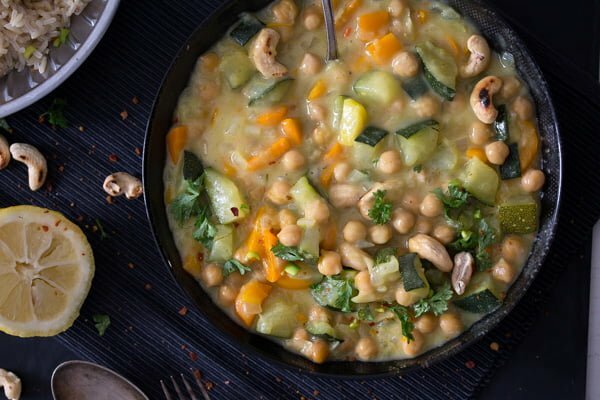 I did the same when cooking this delicious and easy chickpea curry with coconut milk, zucchini, peppers and cashew nuts. A quick, healthy meal that everybody enjoys. The kids might pick out some of the veggies, but fortunately not all of them, I take care to always have at least two sorts of vegetables that I know for sure they will eat, in this case peppers and carrots. I used green curry paste for this zucchini curry recipe. I use that often because it is milder than other sorts, so the children would eat it as well. But if you would like a hotter curry, feel free to use red curry paste for instance. But provided you use red curry or another hotter curry, please reduce the amount!!!! I don’t think one would be able to eat a curry made with one heaped tablespoons of red curry, I never use more than ¼ teaspoon red curry paste in anything. And unless you make your own curry paste, make sure to buy something of good quality, it is worth it to pay two or three Euro more in this case, I think, it really makes a difference. A small jar of curry paste would last for quite a few dishes, so it is really not that expensive in the end. 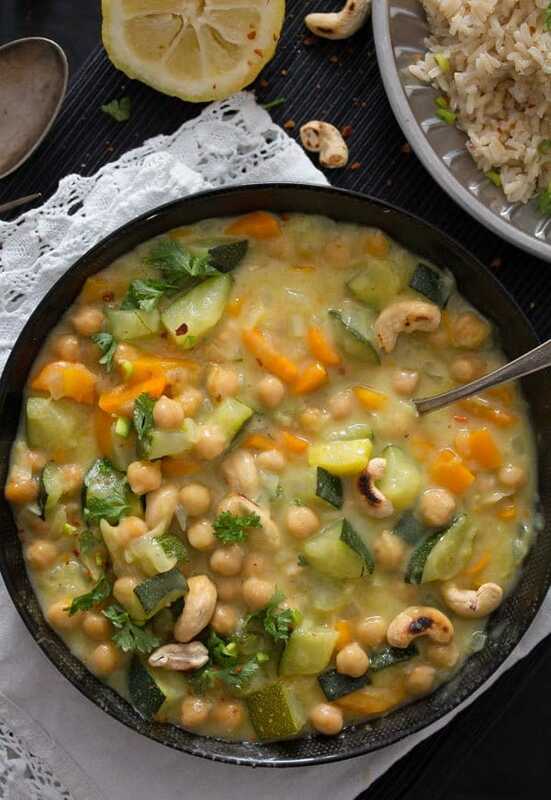 You could use some of the leftover curry paste from making this vegan chickpea curry, to make the Curried Couscous Salad with Chickpeas or the Vegan Potato Curry with Tofu, Tomatoes and Peas. While searching for a new bag of rice in the pantry I happened to find another handful or so of raw cashews that needed to be used soon. So, I roasted them in a hot pan without any fat and scattered them on top of the finished vegan chickpea curry. It was a great idea! I absolutely loved the nut taste and consistency, their crunch was perfect in combination with the creaminess and softness of the rest of the dish and their roast flavor was just amazing. I will definitely experiment more in this direction with my next curries, I think I would like some roasted almonds even more, they are my favorite. I used a regular can of chickpeas, but if you happen to have some chickpeas that you have cooked yourself, use about 200 g/ 7 oz. This doesn’t have to be so exact, a bit more or less chickpeas will be OK. In the case of this particular vegan chickpea curry I used zucchini which are so cheap at the moment, red bell peppers and carrots. The sky is the limit! 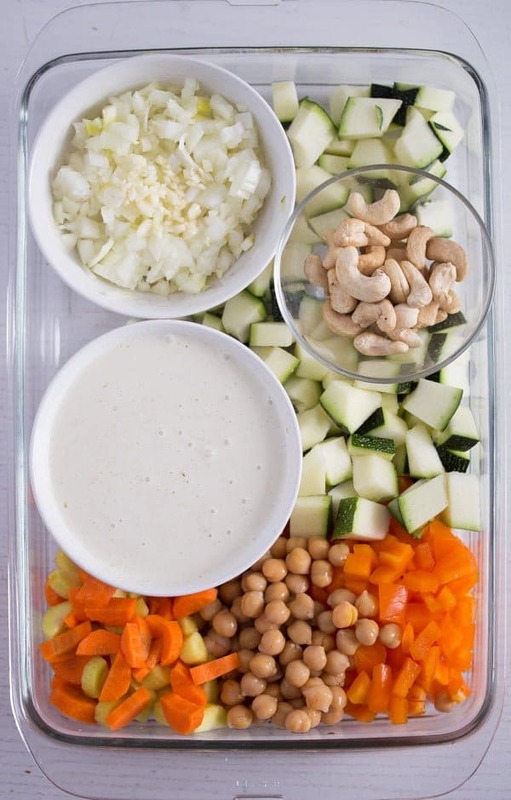 Add some roasted cashews, almonds, sunflower seeds etc on top and, in no time, you will have a delicious, extremely healthy meal, that everybody will enjoy. Start by whisking the coconut milk, green curry paste and salt together in a pot large enough to hold all the ingredients for this zucchini curry recipe. Bring to a simmer. While the coconut milk curry mixture for the vegan chickpea curry is coming to a simmer, chop all the vegetables. First give the onions and the garlic to the pot, let them cook for a couple of minutes, then add the remaining vegetables. Cook for about 8-10 minutes until the vegetables are tender but not mushy. Don’t cover the pot, the sauce should be allowed to reduce a little. To roast the cashew nuts needed to top the easy chickpea curry with coconut milk, give the nuts to a hot non stick pan. You will not have to add any fat to the pan. Roast the cashew nuts in the pan shaking the pan very often, taking care that the cashew nuts don’t burn. This can happen in a matter of seconds if you are not paying attention to the pan. Don’t leave it unattended, the nuts will be roasted in a matter of minutes and it will be sad to spoil them, cashew nuts are quite expensive, at least they are here, where I live. The sauce for the vegan chickpea curry should reduce a little while cooking, but it is usually not creamy enough for me at the end of the cooking time. The veggies don’t need a long time to be ready, so the sauce doesn’t really have the time to thicken properly. And because I like a creamy curry, I tend to thicken the sauce with some cornstarch most of the time. In order to do that I stir together about 1 tablespoon cornstarch with about 2 tablespoons water in a small bowl. You should have a thick yet runny paste. If the paste is too thick add an extra drop of water, if the paste is too thin add a very small amount of cornstarch and stir well. I make a little room in the middle of the pot with the simmering zucchini curry by pushing some of the vegetables to the sides of the pot. Slowly I pour the cornstarch paste into the sauce while whisking all the time to avoid the formation of clumps. Whisk carefully, so that you will not squash any of the vegetables in the pot. 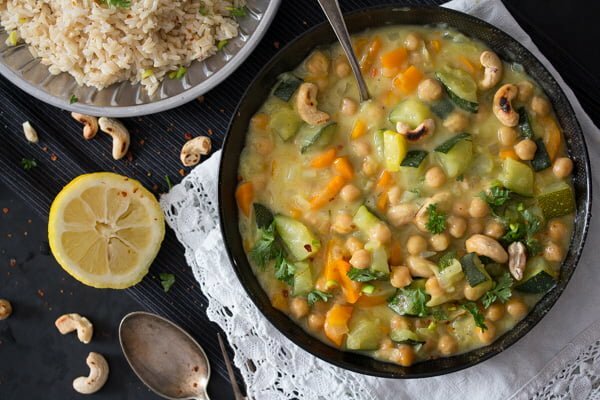 Only give the cashew nuts on top of this easy chickpea curry with coconut milk just before serving. This way the cashews will still be crunchy when you eat them. I actually prefer to leave the cashew nuts on a plate and let everybody top their own plate of vegan chickpea curry with some of the nuts. Not adding the cashew nuts directly to the pot with the zucchini curry is also a good idea in case you have leftovers. The nuts will get soft if they remain in the curry for a longer time and if they get reheated. If you leave them on the extra plate, you will be able to add them to the reheated curry just before serving. 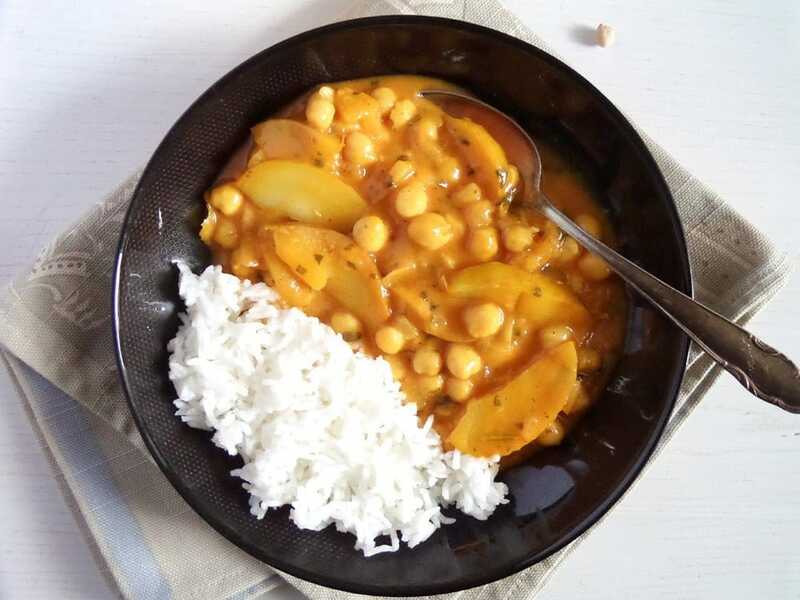 I always serve this vegan chickpea curry with rice. Basmati or jasmin rice are super, but for some reason, when it comes to this particular zucchini curry recipe, I always cook some brown rice, I feel that its robuster taste and consistency fits this dish better. For a change, you could serve this easy chickpea curry with coconut milk over millet or buckwheat. I often serve the curry with a green salad with yogurt dressing or a fresh cucumber raita. The vegan chickpea curry can be easily reheated. Keep the cashew nuts separately and only add them to the curry just before serving. If you have leftover rice as well, keep it refrigerated until ready to use again. I reheat it by giving it directly to the pot of zucchini curry, mixing well and heating the two together in one pot. This is a repost from July 2016. Give the coconut milk to a pan large enough to hold all the vegetables, add the curry paste and whisk to combine. Bring everything to a simmer. In the meantime, chop the onion and the garlic finely. Add them to the pot together with the vegetable broth. Cook uncovered for a few minutes. Halve the zucchini and the carrot lengthwise, then chop the halves into slices. Chop the pepper into slices as well. Drain and rinse the chickpeas. Give everything to the sauce and cook, uncovered, for about 8-10 minutes until the vegetables are done to your liking and the sauce reduces a little bit. Adjust the taste with more salt if necessary. To thicken the curry mix together the cornstarch with the water. You should have a thick yet runny paste. Make a little room in the middle of the pot with the simmering zucchini curry by pushing some of the vegetables to the sides of the pot. Slowly I pour the cornstarch paste into the sauce while whisking all the time to avoid the formation of clumps. Whisk carefully, so that you will not squash any of the vegetables in the pot. Let bubble once or twice and thicken nicely and remove from the heat. Adjust the taste with more salt and a little lemon juice, if necessary. While the curry is cooking heat a large pan without adding any fat. Roast the cashews, shaking the pan often to avoid them burning. As soon as they are golden, transfer them to a plate. Scatter them over the curry just before eating to avoid them getting soft. Note 1: Depending on the brand of green curry paste I use, I might take one or two tablespoons curry paste, some brands are hotter than other. Note 2: You can use other kinds of curry paste, for instance yellow or red curry paste. Please adjust the quantity according to the heat of the curry paste and definitely take less curry paste if you use red curry paste. In this case I would start with ¼ teaspoon and add more if required. It looks delicious and it’s so healthy with all those veggies and the curry. Yum! That looks so good Adina! We love curry recipes, and we like zucchini. The addition of roasted cashew is perfect. Great vegan recipe to have handy for those meatless suppers. What a beautiful dish, Adina! I would never guess it’s vegetarian. I’m an avowed carni- and piscivore, but somehow I tend to eat less animals during the summer…and this dish looks so appetising! The more the merrier…i love zucchini! Your version of vegan curry looks out of this world, Adina, and it has EVERYTHING I love. Perfect! 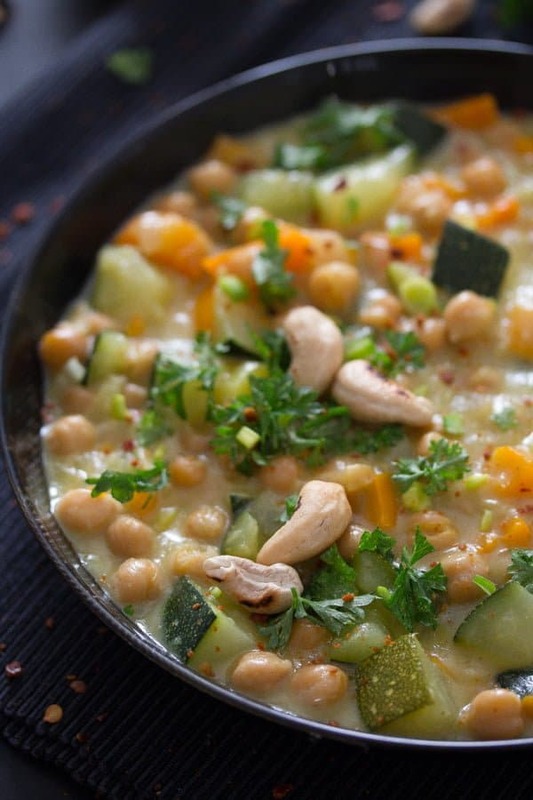 I love spicy food and zucchini and chickpeas are a great combo for a curry. But I would have never thought of adding cashews to them. Loving this vegan and comfy curry. We made this last night for dinner and it was fantastic! Even in 100 degree weather we were gobbling it up 🙂 Used a bunch of zucchini, a little broccoli and a carrot. You are SO right about the cashews, tossed them in the toaster oven dry for about 7 minutes and sprinkled them on right before we sat down. Both my husband and I were raving about the delicious flavor and texture they added to the dish. What a great recipe Adina thanks for sharing it! Adina, this curry looks so delicious! Love that it is loaded with zucchini. What a flavorful way to enjoy veggies! yumm! I see I’ve already commented here two years ago and still agree it looks fantastic in spite of the lack of meat or eggs, but I must add something funny: when I used store-bought curry pastes (nowadays I make my own), it was at least several tablespoons of the hottest one in a dish for two, haha! We wouldn’t even feel the heat with one teaspoon… And once when I had to buy a different brand which proved much milder, I gave the whole jar to a family member (otherwise I’d have thrown it away). I guess you don’t know many chilli addicts as crazy as we are! Wow! I am wondering how you would find this curry paste I got. A tiny packet, about 4 tablespoons, and I cooked 5 meals with it, the hottest yet tastiest green curry I’ve ever had. It really differs from brand to brand, I suppose, so one must try and decide how much it should be. 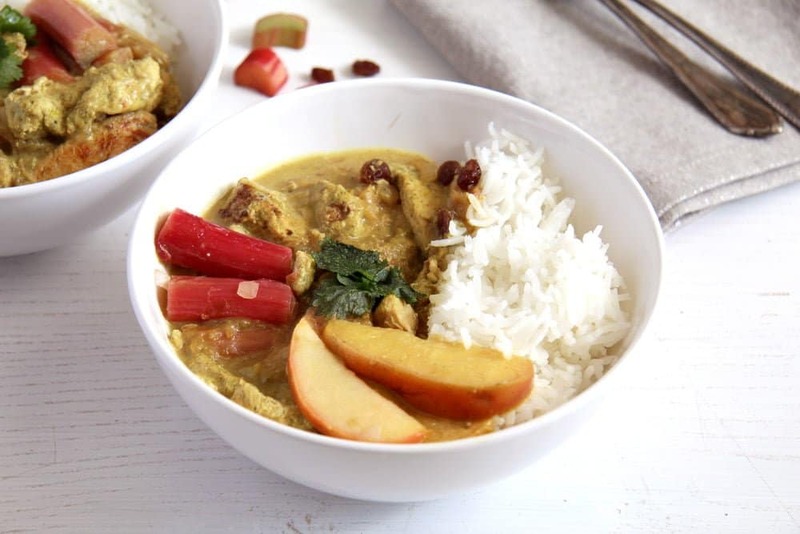 This curry looks sooo delicious,sooo creamy.. This one is the perfect recipe to go with steamed or cumin rice… Love this totally..